Sarah Gonzales, a grade school English teacher, joins the 150,000 Pinoy OFWs working in the United Kingdom to support her husband, Teddy Gonzales, in making a better living for their family. More than just a chronicle of the Filipino experience working as nurses and caregivers in the U.K., this story also charts Sarah's journey to self-discovery - from a submissive wife who makes sacrifices to make way for her Teddy's aspirations to an empowered woman who finds dignity and pride in a humbling job as a caregiver in London. Caregiver is a 2008 Filipino drama film. 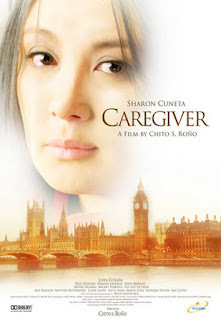 The film stars Sharon Cuneta portraying the role of Sarah, a mother who left her son in the Philippines and also a teacher who relinquished her profession in lieu of care giving in London, in hopes of augmenting her salary. Chito S. Roño directed the film and Chris Martinez wrote its screenplay.